If vegetables used to be meat's poor relation on dinner plates, they have in recent times moved towards centre stage, with plant-based diets now generating excitement as opposed to feelings of missing out. Demand for vegetables like cauliflower and kale - never before considered to be the sexiest of produce - has increased so much that farmers globally have struggled to meet supply in recent times. However, it would appear that not all vegetables are created equal. While we have fallen in thrall to the vibrancy of farmers' market produce, the frozen veg category is often ignored, as evidenced by a recent study from Stony Brook University in the US which found that there is a consistent negative bias among consumers toward frozen vegetables as opposed to fresh ones. But arguably, shoppers are doing a disservice to this part of the frozen aisle in bypassing the veg options here. If your memories of frozen foods dates from the microwaveable pizza/TV dinner/bags of mushy peas era, a quick perusal of current supermarket options reveals new and exotic offering such as bags of edamame and broad beans mix; sweet potato slices and time savers like frozen diced onion. Of course, it's not just about what's available in freezer sections. Jamie Oliver is a long-time fan of using frozen veg and he advises freezing a glut of fresh seasonal produce like green beans, broccoli, sweetcorn and broccoli and grabbing a handful for whenever you need some in curries, soups and simple pasta sauces. So by ignoring frozen veg, are we missing a trick? One of the main reasons that home cooks may be reticent about using frozen veg is their concerns as to whether they are as nutritious as fresh produce. Dietitian Orla Walsh says that most people in Ireland do not eat enough vegetables, so before people start worrying about quality, she would urge them to focus on quantity first. "In 2015 a study sought to assess the vitamin retention in eight different fruits and vegetables comparing both refrigerated and frozen storage. Four vitamins, vitamin C, B2, E and vitamin A, were evaluated in corn, carrots, broccoli, spinach, peas, green beans and strawberries. "The results were in some ways surprising. Frozen fruits and vegetables did sometimes contain more of these vitamins than the fresh varieties, especially where vitamin C was concerned. However, most of the time the vitamin content was the same." She points out that this is just one study but that other studies may provide alternative results as so many factors influence the nutritional composition of the vegetables we eat - where the veg are grown, the soil that they're grown in, the gradient of the ground and sun exposure. Additionally, the age at which they are removed from the ground as well as the length of time from farm to fork, and how they are transported and stored, matters. "In some ways it's a bit of a minefield. However, the overall message needs to remain simple: just eat more veg." Chef Brian McDermott, whose latest book Donegal Table was published earlier this year, says that frozen vegetables certainly have a place in his kitchen. "The big plus of freezing vegetables that are in season is that they become less expensive and you are still eating them with the goodness that you had at the harvest time in off-season periods," he says. "It's like bringing seasonality to your freezer because it means your freezer has what was in abundance in June, July and August and all you've done is expand that period." He suggests using frozen members of the brassica family - cauliflower and broccoli for example - and to keep a bag of frozen peppers in the freezer ready to blitz for a quick sauce, although their texture will not be suitable for stir-fries. The ubiquitous bag of peas, generally present in most people's freezers, is also a hero ingredient. "The first thing you go to immediately is the frozen bag of peas, not just for an injury - but to say to yourself 'peas are just so versatile - what can I do with them?' A simple pea and mint soup takes eight minutes from a frozen pea and sweating onions, garlic, stock and a small bit of crème fraiche and seasoning it and finishing it with fresh mint - done." 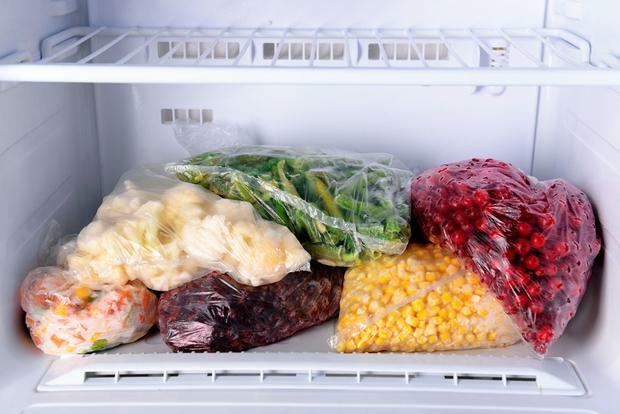 In terms of freezing your own veg, he advises cutting it into uniform portion slices, which allows it freeze quickly and always wrapped in clear cling film or a zipped freezer bag to prevent freezer burn which can cause contamination. For those who have experienced soggy cauliflower or broccoli after cooking it from frozen, his tip is to not thaw it out. "If you thaw it out, you're going to end up with a tired form vegetable. If you take it from frozen and steam it, to me that's the secret of bringing it back to some element of goodness." Tara Walker of the East Cook Cookery School, Termonfeckin, Louth believes that frozen veg are a great staple for those days when you're short on time. "They are not maybe for weekend cooking or entertaining and special occasions but they're definitely a quick fix," she says. "The best use for them is sprinkling them into other dishes - it's making sure you're putting them into things that have their own flavour." Dishes she suggests that can really benefit from the addition of a few frozen veg are soups, risottos and omelettes and she also advises that as some frozen veg can get waterlogged - carrots for example - cooks need to be careful what they do with them, but that sweating them off in onion and garlic, with additions such as Worchester sauce or spices like cumin, can liven them up. Frozen peas and sweetcorn are some of her freezer favourites and she recommends trying frozen green beans topped with some bacon, garlic and lemon juices. She's has also started freezing garlic. "I wouldn't use frozen garlic in a hummus or a guacamole where I'm not cooking it out any further but when you want to get a soup, stew or sauce on and where you're going to sweat it off for a while, it's perfect. And if it helps you cook from scratch, I think it's a good a thing." Roasting is the perfect technique for producing great-tasting vegetables on occasions when you have a lot of mouths to feed. I love this recipe because it's guaranteed to produce that all-important crispy texture. These vegetables can be prepared and frozen in advance and then taken out of the freezer and roasted when required. 1. Place a large flat tray in a hot oven for 15 minutes at 200°C/400°F/gas Mark 6. 2. Peel and roughly chop the sweet potatoes, potatoes, carrots, butternut squash and parsnip into thick-cut, chip-style shapes. Cut the red onions and shallots into wedges and chop the garlic. 3. Place the vegetables in a bowl and add the oil, black pepper and nutmeg. Add the fresh rosemary and thyme and mix together. 4. Place the vegetables on to the hot tray. You should hear them sizzle immediately. 5. Quickly return the tray to the oven and cook for 30 minutes, shaking the tray halfway through. 6. Drizzle with the honey and return to the hot oven for another 8 minutes, then serve.